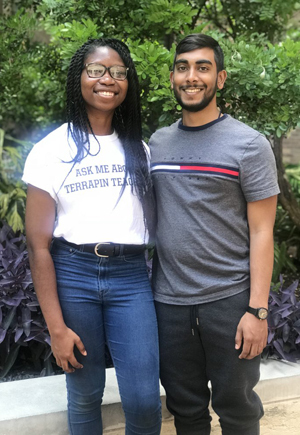 Two University of Maryland undergraduates won a prize for their poster at the 12th annual UTeach Conference held in Austin, Texas, in May 2018 for their work in the Terrapin Teachers program. Terrapin Teachers is a UMD program that aims to increase the number of highly qualified secondary science and mathematics teachers. In addition to earning a science or math degree, students who complete the program are eligible for certification as a middle or high school teacher. Based on the national UTeach model, Terrapin Teachers is a joint initiative between UMD’s College of Education and College of Computer, Mathematical, and Natural Sciences. Biological sciences junior Precious Azike and computer science senior Joshua Pooranmal created their poster, “Developing Critical Perspectives in Step 2: Maintaining an Open Disposition While Shifting from Student to Teacher,” to showcase how Terrapin Teachers helped them become better teachers through self-reflection. The students drew on their experiences observing and then teaching a class at Nicholas Orem Middle School in nearby Hyattsville, Maryland, as part of the Terrapin Teachers course TLPL 102: “Inquiry Teaching of STEM in Middle Schools.” Azike taught an eighth-grade science class about rising global temperatures. Pooranmal taught a seventh-grade math class about mathematical expressions and equations. After teaching their respective classes, Azike and Pooranmal reflected on how they performed in the classroom. They also examined how teachers’ unconsciously held assumptions could lead them to make mistakes while teaching. 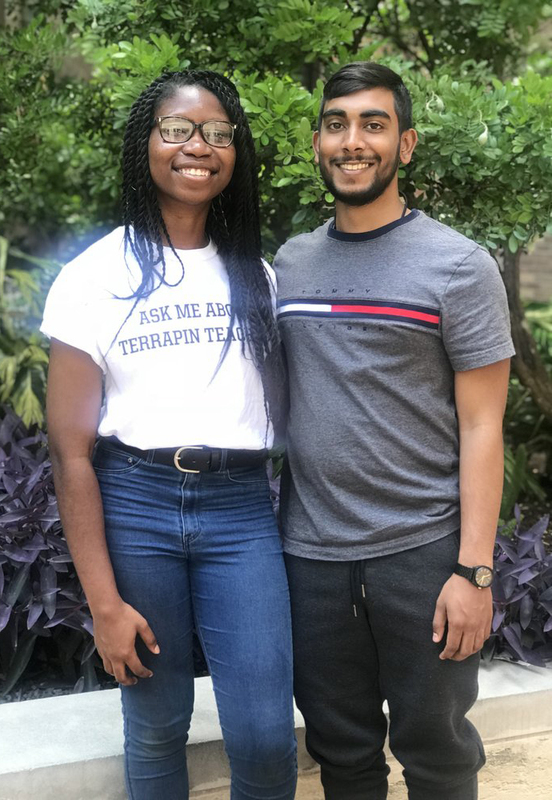 Because most UTeach programs do not include a component on overcoming unconscious assumptions, Pooranmal and Azike used their poster to spread awareness of the Terrapin Teachers course and help other programs integrate similar themes into their curricula. Azike, who is also a Banneker/Key Scholar, came to Terrapin Teachers through her advisor Francisca Saavedra, who is assistant director of the undergraduate biological sciences program. Pooranmal discovered Terrapin Teachers when trying to fulfill his degree requirements as a computer science major. Thanks to Terrapin Teachers, Pooranmal found that working in education is extremely meaningful for him. Azike hopes to become a teacher in her hometown in the future. “I came from the Baltimore County Public Schools system, and I know there are a lot of students like me who could benefit from a strong mentor,” Azike said.